Over the past half-century, humans have sent probes throughout the solar system and beyond. We've learned a tremendous amount about other planets, other stars, and what it would take to found a colony beyond Earth. And we've also spent a lot of time goofing around. Alongside the wondrous objects we've shot out into the black, there have been quite a few oddities. Here are some of the most memorable. These were phonograph records on Voyager-1 and 2. They contain 116 analogue images, natural sounds of Earth, greetings in 55 languages and a printed message from Jimmy Carter and U.N Secretary-General Kurt Waldheim. The 3" tall aluminium sculpture is on the Moon, placed there by Apollo 15 on August 1, 1971. It's a memorial to dead astronauts and cosmonauts. The plaque next to the sculpture is a list of 14 people (8 American and 6 Soviets) who had died. Only the half of them actually died in spacecraft, (3 of them in the Apollo 1 fire, and 4 because of the Soyuz 11 re-entry pressurization failure) five of them in an aircraft accident, one astronaut in an automobile accident and one cosmonaut from disease. Charles Duke was the lunar module pilot for Apollo 16, and he was the youngest person (at 37) to walk on the Moon. Before he left our natural satellite, he placed a photograph of his family on the ground. The Apollo 15 took 385 postcards to space, returned and sold them. Some with autographs from the crew, some without. 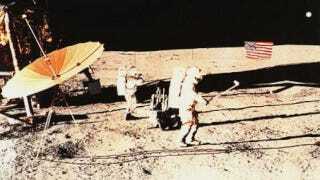 Alan Shepard hit two golf balls before the Apollo 14 took off from the Moon in Februrary 6, 1971. A British team (Steve Daniels, John Oates and Lester Hains) designed a plane made from paper straws, with a 3-foot wingspan, and sent it to the space with a helium balloon. It went to 90000 feet before the balloon popped. They paid 8000 pounds ($12500) for this fun. The Book of the Soul (Ruhnama) written by Saparmurat Niyazov, the former Turkmeni president (really he was a dictator with a cult of personality) and a Turkmeni flag was included in capsules to two Japanese satellites. The Ruhnama is a spiritual guide to the Turkmeni people. The capsules returning home somewhere around 2151. A month ago, two Canadian teenagers sent a Legonaut into space with a helium balloon. They reached 80000 feet (24,5 km) high. Matthew Ho and Asad Muhammad (both only 17) used four old digital cameras, bought on Craigslist, for the entire cost of $400. The Lego Man was on a styrofoam box including the cameras and a GPS unit. More pictures of the trip are on Lego Man In Space's Facebook account. The original lightsaber used by Luke Skywalker in Star Wars Episode VI: Return of te Jedi was on-board the STS-120 (Discovery) mission in 2007. Chewbacca gave the legendary weapon from to Oakland International Airport, and after to Houston, where the Stormtroopers, R2-D2 and other notables were waiting for it.